TS Schools Vidya Volunteers(VVs) Recruitment 2018 with an increased Honorarium of Rs.12,000/- per month in the Academic Year, 2018-19 Notification-New Guidelines,Selection Procedure, Applications @cdse.telangana.gov.in . The Telangana state government has sanctioned 16,781 academic volunteers/vv's to teach this year in Government, ZP Schools PS, UPS, High schools in the state, said that these appointments should be taken immediately. Teacher appointments taken by TRT are likely to be delayed by court cases. Vidya Volunteers(VVs) services will be continued until those posts get clearance. Vidya Volunteers Recruitment 2018 notification as per need in Telangana schools enrollment Govt of Telangana has decided to appoint 16781 Vidya Volunteers in existing vacancies as per new strength as on Juune 2018 and as per new rationalization guidelines. 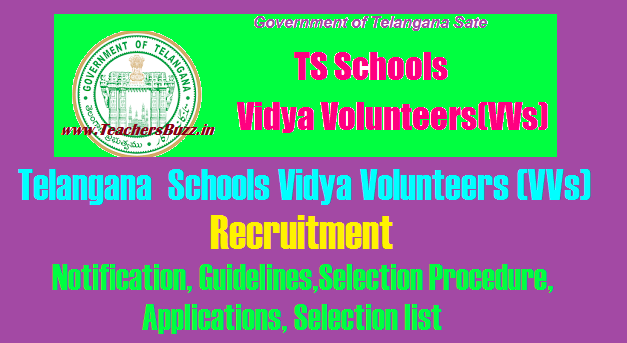 16781 Vidya Volunteers Recruitment Notification 2018 in Telangana issued by SCHOOL EDUCATION DEPARTMENT vide G.O.Rt.No. 48 Dated: 02-06-2018 stated as Engaging the services of (16781) Vidya Volunteers through School Management Committees (SMCs) with an Honorarium of Rs.12,000/- per month in the Academic Year, 2018-19 Permission Accorded. VVs recruitment Online application form ssa.tg.nic.in, Last date for apply online, selection procedure, VVs recruitment guidelines, how to apply and selection list/merit list preparation procedure, Application forms for VVs will be available at TSSA web portal ssa.tg.nic.in , cdse.telangana.gov.in Telangana State government has decided to appoint 16781 Vidya volunteers on a temporary basis for one year. School Education – Engaging the services of (16781) Vidya Volunteers through School Management Committees (SMCs) with an Honorarium of Rs.12,000/- per month in the Academic Year, 2018-19 Permission Accorded – Orders – Issued. 3) From the C&DSE, Telangana, Hyd, Lr.Rc.No.44/PS-2-1/2017-2, dt.21.05.2018. 1. The services of Vidya Volunteers will be engaged from 16th July, 2016 to 20th April, 2018 in the Schools as approved by the District Collector concerned. Their services are purely temporary and can be terminated before 20th April, 2018 also, based on justifiable grounds, by the School Management Committees (SMCs). 7. Engaging of Vidya Volunteers in Agency area shall be from local ST Candidates only. If local ST Candidates are not available, then other ST Candidates from Agency Area and later non-ST candidates residing in the Agency area shall be considered . a) For Primary Schools(Classes I to V): Intermediate with D.Ed. In case of non availability of Candidates with D.Ed, B.Ed Candidates may be considered. 16) The District Collector shall draw a detailed Schedule for completing the selection of the Vidya Volunteers and communicate the List of Vidya Volunteers to the MEOs by 12th July,2016 and the MEOs shall complete the verification process and furnish the List to the SMCs by 15th July,2016, so as to engage the services of the Vidya Volunteers by the SMCs from 16th July,2016 for the Academic Year 2016-17. 2) From the Director of School Eduction, Telangana, Hyd, Lr.Rc.No.330/PS2-2/2015, dt.23.5.2016. 5)From the Director of School Education, Telangana, Hyd, Lr.Rc.No.330/PS2-2/2015, dt.27.06.2016. #Application form for TS Schools VVs Recruitment 2018.